James Mackenzie… the man, the myth, the legend who gave his name to Mackenzie Country. Folklore says he could drop a cattle beast with his fist, outrun a horse and eat a brace of birds at one sitting, and now his name resides forever among the million hectares of Canterbury highland known as the Mackenzie Country. James Mackenzie, a redoubtable Scotsman, was only 35 years old in 1855, the year he and his dog, Friday, were caught in the act of driving a thousand stolen sheep over a mountain pass toward the uninhabited area that now holds his name. At Mackenzie Pass a pyramid-shaped monument claims to be the spot where John Sidebottom and two Maori men, Taiko and Seventeen, nabbed the rustler, who promptly escaped, and walked to Lyttelton. He was arrested there, hauled off to Christchurch, found guilty and given a five-year sentence. Declaring himself innocent, he tried to escape three times and succeeded twice. Legend has embroidered the facts. His life took on legendary proportions. Here was a simple Highland shepherd who took on the big boys by filching the flocks from Canterbury’s autocratic and moneyed pastoralists. His exploits and escapes from prison turned him into a folk hero, and yet media portrayals published at the time were less becoming. James served only nine months of his sentence. After his escapes, it was said no jail could ever hold him. In a popular move, he was pardoned and he disappeared off to Australia never to be heard of again. Today there are two ways from Canterbury into the Mackenzie Country. The best known is over Burke Pass between the Two Thumb and Rollesby Ranges. 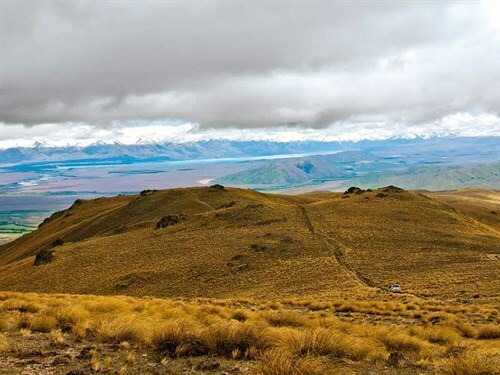 Those who love stories might like to take the more adventurous route to cross Mackenzie Pass from Timaru, following his trek through the foothills. Mackenzie Country is still spectacularly empty. The village of Fairlea lays claim to being the gateway to the region and to that end there is a flattering bronze statue of the famous shepherd set beneath an elm tree in the centre of the main street.